» Web browser (Internet Explorer recommended), with Adobe Flash Player. » You may want to test your computer setup with a sample question. I can't hear the test questions. Be sure that your computer's speakers are on and turned up. If you are listening through a headset, be sure that its volume control is turned up. You may also want to check your computer's audio controls (in the control panel, choose sounds and audio devices). The slider for volume playback should be moved, and not muted. If you are using a microphone headset, be sure that it the microphone and speaker jacks are plugged into the right ports on your computer. What kind of microphone should I use? We recommend a headset microphone like the picture at the right. If possible, avoid USB style microphones. If you use your laptop's internal microphone, be sure to keep your head close the computer and to speak loudly. How do I connect the microphone to my computer? 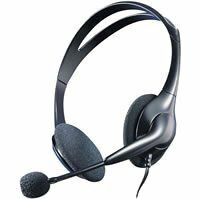 Most headset microphones use either color-coded cables or icons to identify the speaker and microphone lines. Match these up with the correct port on your computer and plug them in firmly. How far away should the microphone be from my moutn? Keep the microphone about 3cm away from your mouth, like in the picture at right. My microphone is still not working. After connecting your microphone to the computer, you may need to restart your computer. Check your computer's audio controls (in the control panel, choose sounds and audio devices). The microphone should be selected and the slider should be at least half way to maximum. If your microphone has a mute button on the cable, be sure that it is turned off. Your microphone can also be adjusted through the Adobe Flash Player control window (see below). I can't hear my answer to the test question. When you try the sample question, you will see a microphone settings box for the Adobe flash player like the sample at right. You may adjust the microphone settings here. Be sure to select reduce echo. When you speak, the green bar should move. There is a lot of static or noise when I listen to my answer. This is common difficulty with laptop soundcards. If you can hear your words, then the recording quality is satisfactory. If you are using a laptop, the noise could be electrical interference from your computer's power adaptor. Try disconnecting the power and running your laptop on its battery. Please check if any background room noise is interfering, from ventilation systems or other devices. Quiet, please! Before you take your assessment, try to find a quiet place where you will be uninterrupted. Close open windows if there is noisy street traffic. Please turn off your phone. Close computer windows Before beginning the test, please close all active windows on your computer, including Skype, internet chats, media players, and any programs that use audio. What if I'm interrupted? If possible, ignore the interruption and continue taking the assessment. Even if one or two of your responses are lost due to interruption (or technical problems), it will have no impact on your results. there will still be sufficient material to assess your communication. How many times can I take the sample question? You can take the sample question as many times as you like and listen to your answer. I don't like the sound of my voice in my response. We rarely listen to our own voice, so most people are surprised by the sound of their recorded answers. The audio you hear on the computer is a poor representation of the natural richness of your voice. My UserID or password are not working. You will receive an email with your UserID, password, and link to the test. You may want to paste your UserID and password directly into the login page. You have ten days from your purchase date to complete the test. After ten days, your UserID will expire. Your UserID and password are valid for taking one complete E-CAP assessment. If your UserID and password are valid but not working, contact us at support@e-cap.net. My computer or browser crashed during the assessment Please relaunch your browser (Internet Explorer recommended) or restart your computer and begin the test again. Your previous answers will be erased, so be sure to answer all questions on any retakes of the test. If you experience repeated problems with the test, contact us at support@e-cap.net. I started taking the assessment and I think I purchased the wrong level. Do your best to answer all questions in your usual communication style. Even if you are unsure how to answer a question, please talk about the subject as best you can. The results will still be valuable for your communication improvement.